A few years ago the “it’s senseless to ask what came before the big bang because there was no before” meme was hot. I remember Stephen Hawking saying it in his documentary a year or two ago. There now seems to be a good amount of push-back from the rest of the cosmology community to this certitude. 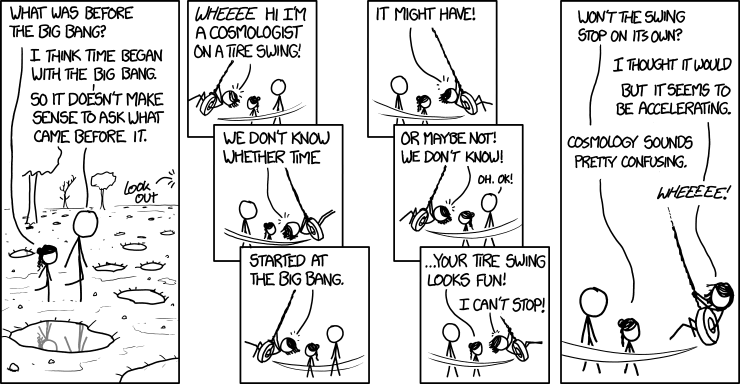 via xkcd: Cosmologist on a Tire Swing. “Cosmology sounds pretty confusing”. Amen. This entry was posted in Zeitgeist and tagged Astronomy, Big Bang, Cosmic microwave background radiation, Cosmology, Gravitational wave, South Pole Telescope, Stephen Hawking, Universe. Bookmark the permalink. Interesting that suddenly physics has realised that ex nihilo creation is a daft idea. Yet it seems to me these new ideas (or changes of opinion) about ‘before’ the BB are not progress. They seem to involve simply extending the theory of Materialism back by a tenth of second. Progress would be admitting that metaphysics comes before physics. Nice cartoon. “A more epistemologically cautious majority reasserting itself.” This is great way of putting it. I shall steal your phrase for my essay if that’s okay. Shame. I thought perhaps physicists might be becoming interested in metaphysics. On metaphysics, I’ve noticed that many physicists, particularly theoretical ones, try hard to distance themselves from it. It reminds me of something I once read that observed that the more similar two ancient schools of philosophy were, the more likely they were to be bitter enemies. That’s a good point. To be honest, the failure of theoretical physicists (on average) to engage with metaphysics is something inexplicable to me. I just don’t understand how anyone can be so pig-headed. My gran would have called it ‘cutting off your nose to spite your face’. I think your typical physicist would say that they engage in science, in testable propositions, which metaphysics lies outside of. Of course, a lot of theoretical physics has moved so far beyond the realm of testability that where some see science, others see metaphysics. That’s fine. Physicists must stick to physics with its demand for intrasubjective testability. Physics is therefore non-reductive and we must look to metaphysics for a fundamental theory, as was always the case. To suppose that physics can hold to its testability criterion and at the same time dismiss metaphysics as a source of knowledge is a recipe for going nowhere. I would rather just totally ignore the distinction between physics and metaphysics. I see no point in it other than for organising teaching schedules and faculty staffing. As someone famous once said, forget who it was, the world is not divided up into departments like a university. .